Happy Happy Anniversary!! This is a very very beautiful post. Many more years and lovely recipes to your blog. Soma, thank you so very much. Azita, Happy Anniversary. And what a loving tribute to your mother. she must have been a phenomenal mother in every way. i am sorry you lost her. we all have a part of our mothers in us, forever. i love this dish, i have kashk lying in my fridge but have been lazy about making this- your beautiful photo is a great inspiration for me! Happy anniversary to your wonderful blog. Shayma, thanks a lot, I appreciate it. I'd love to see your photos of this dish. Maninas, thank you very much, you are so kind. Thanks for passing from my blog giving me the opportunity to find out about you as well. I look forward to learning more about Persian cuisine with which I am not familiar with. Lovely tribute to your mother and hope you will record all the knowledge she has passed on to you. During the first year of my blogging I did the same thing. I recreated all those lovely recipes my mother used to make and which some of those recipes were a challenge as I didn't even dream I could cook them. At the same time I was curious to learn and taste recipes from around the world I knew nothing about. I loved reading this post and I can relate as well; I started my blog in loving memory of my grandmother who cooked for all of us and did not get enough recognition or gratitude while alive. 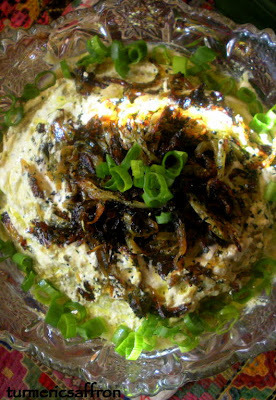 A Persian friend of my neighbor's brought this dish one night and I pretty much ate the whole thing myself! It is sooo good!! tasteofbeirut- Thank you so very much, that's very kind of you. Hi! thank you for the recipe. I will visit some persian store to buy kashk. Though I read on some blogs that yogurt can be used as substitue. yes, yogurt is a good substitute. Tomorrow my parents are coming to visit me in Montreal and I want to surprise them with that I learned on your blog. 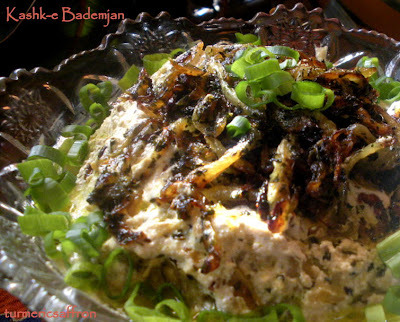 Now I was wondering: can I make the kashk-e-bademjan today and serve it tomorrow? What should I do so the taste would not suffer? Same question actually for shevid-baghali polow. Can I make it today? And if I do it, how should I heat it up? I usually do not prefer to use the microwave. Nazanin Jan, I just sent you an email. In my opinion most Iranian meals taste better the next day. You can reheat rice in the oven or on the stove on medium-low heat. This is my favorite dish!! 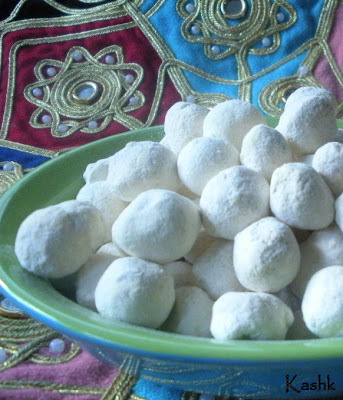 I just bought powdered kashk and was looking for recipes and found yours. Can you please let me know if it is possible to use the powdered kashk instead of liquid, and if so, how much should I use? Sam, mix 1/2 cup of dry powder with 1 cup of hot water...adding the water gradually and mixing it till it reaches the desired consistency. Powdered kashk needs to be reconstituted to liquid for kask-e bademjan and is not used by itself. Leftover liquid kashk needs to be refrigerated. I store mine in the freezer. Can you explain what you mean by "squeezing out the bitterness" from the eggplant? Hi anonymous jan, what I mean by "squeezing out the bitterness" from the eggplant is to simply get rid of the bitterness. Some of the large eggplants have a bitterness to them and by salting them prior to cooking you're able to get rid of the excess moisture and bitterness. Another method is to soak them in salted water for an hour or so. When I bake or broil them in the oven after removing the skin with a back of a large spoon I would gently press them down in a fine mesh strainer to get the bitter liquid out. Azita, I can't tell you how happy I am to see such a well thought out Blog such as this one. 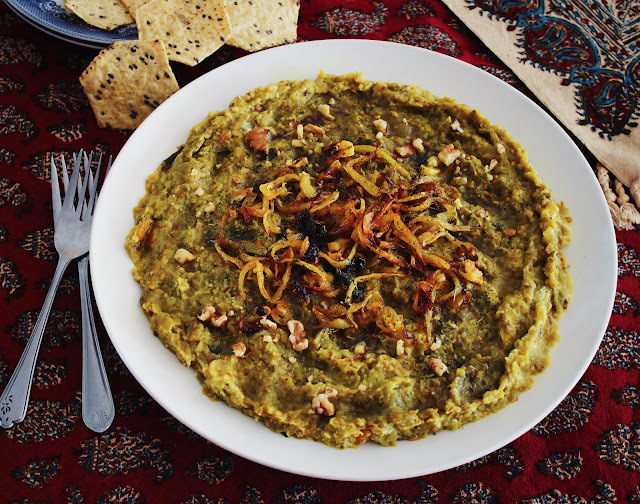 As an Iraqi we share most of our dishes with our good neighbours, with some very minor differences. This one stands out for me - because it's not on our menus (I wonder if it's because I'm not familiar with kashk???) it's absolutely delicious, and I've always wanted to know how to make it! I just discovered your blog last week and have enjoyed going through your recipes. ingredients and then look for the recipe online and see how close i am to the original. The other day i ate at Persepolis in NY City and loved the dip they call "BABA". I believe it is this recipe that you have posted for Kashk-e Bademjan but with the addition of walnuts and pomegranate molasses as per what they listed. Can you please post the recipe for that. hi. i couldn't find kashk in jar and a friend of mine just got me some dried kashk. how to i rehydrate them? what is the proportion. thanks! i'll attempt to make kashk-e bademjan. i feel in love with it and cant get it off my mind! lol. wish me luck! Haidee, place 1/3 cup of dried kashk in a small bowl, pour in just enough water to cover and let soak until softened. If I left out the saffron, would this dish still taste good? Yes, you can skip it!